Fujita Kanko to Launch New Hotel Brand Targeting Millennials | Fujita Kanko Inc.
November 19, 2018, Tokyo – Fujita Kanko Inc., a leading Japanese hospitality company headquartered in Tokyo, announced the launch of “Tavinos,” a new hotel brand aimed at adventure-seeking millennials and like-minded travelers from around the world. According to the Japan National Tourism Organization (JNTO), the number of international visitors to Japan has increased in recent years, hitting a record high in 2017. 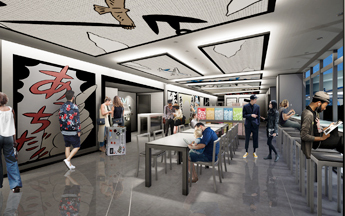 Fujita Kanko is adding this brand to their portfolio of 70+ well-established properties to target international visitors and millennials, a fast-growing, yet relatively untapped segment for the company. 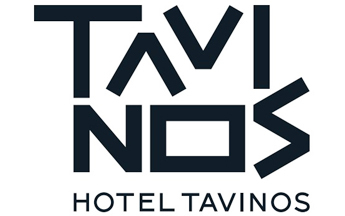 With a state-of-the-art blending of design, space, and technology, the company is positioning Tavinos as a sleek hub for international visitors to meet fellow travelers, gather local information, and have fun during their travels. 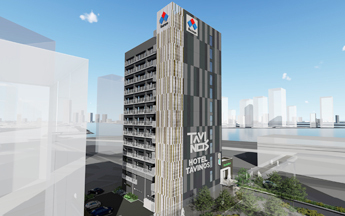 By implementing technologies such as an AI concierge and automated check-in/check-out as well as minimal staffing, Tavinos can offer average room rates of 10,000 yen/night for a twin/double room at premier urban locations. 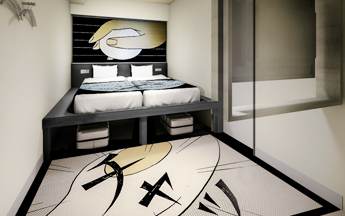 Tavinos’ design concept is based on Japanese pop culture, with eye-popping Manga (animation), covering the hotel. The stylish guest rooms, 12 square meters/129 square feet on average, are minimally furnished with smart storage to maximize space. Continental breakfast will be available in the spacious lobby lounge, also serving as a communal area for guests to meet and mingle. An AI concierge will provide local information and matching for guests interested in similar activities.